The B9 vitamin known as folic acid, helps manufacture and stabilize new blood cells. 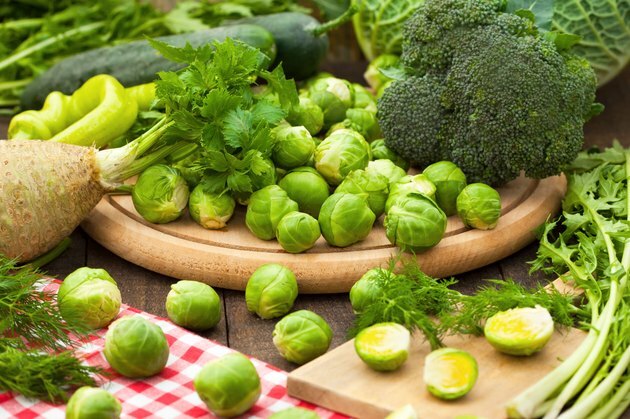 Certain foods contain folic acid such as oranges, liver, broccoli, spinach and brussels sprouts, Drugs.com reports. It may help stop the problems associated with cancer and its relationship to your DNA. If you have anemia, your doctor may prescribe folic acid to help build up your blood levels. Another type of anemia called pernicious anemia can be treated with a combination of medications, including folic acid. You also may take it as a single supplement or as part of a multivitamin. You may experience side effects from its use. Folic acid, like many supplements and medicines, can disturb your stomach when you begin using it. Side effects such as nausea often occur because your body has not yet become accustomed to having the nutrient in its system. After you pass through the adjustment period, nausea should stop by itself. You can take over-the-counter anti-nausea medicines to help squelch your nausea if it bothers you too much. If you have severe nausea from folic acid that includes a loss of appetite and vomiting, seek counsel from your physician. You may have difficulty sleeping at nighttime, Drugs.com states, when you start using folic acid supplements. You may start to fall asleep and wake up again. You may find yourself sitting up instead of sleeping. Not getting enough sleep can cause problems with you normal daily routines. Call your physician and get help if this side effect continues. Diarrhea may occur as a side effect to this medication. Vitamin B9 may cause you to have loose stools and cramps, the University of Maryland Medical Center indicates. You may need to make several trips to the bathroom when starting this medication. Make certain you drink extra water if you have diarrhea to avoid becoming dehydrated. If your diarrhea continues as a problem for you, seek medical help. You may feel blue or down in the dumps, Drugs.com indicates, when you initiate treatment with folic acid. Mild depression, while categorized as a non-serious folic acid side effect, may present itself as a serious problem if it continues or feels severe. You may lose interest in things you enjoy and you may feel empty and hopeless. If this occurs severely, especially if you have suicidal thoughts, seek medical help immediately. A lesser side effect of folic acid, irritability, also may occur. Both of these mental difficulties should end without help.